How would you investigate bugs in Apache Zookeeper? What happens when things go wrong in your organisation? How does your organisation respond to major incidents like service outages? Major incidents WILL happen and are COSTLY. Interested to learn how new PagerDuty integrations for AWS can help your teams drive real-time digital operations? Join Joe Norman, AWS Solutions Architect and Eric Burns, PagerDuty Senior Solutions Architect as they discuss how PagerDuty integrations have optimized real-time operations for AWS customers like William Hill, FanDuel, Pitney Bowes, and Xero. It’s not news that the world has gone digital, requiring you to interact with your customers 24×7. What may be news is that to be successful, you need to be able to operate in a truly real-time fashion, empowering the individuals and teams that own and operate digital services to better serve customers. The benefits of being effective at real-time work are tangible, with mature companies resolving incidents 2 hours faster on average than less mature peers. PagerDuty has been in the business of real-time work for almost a decade, and we’ve developed a maturity model that complements DevOps benchmarks and research such as the DORA State of DevOps report. The model uniquely focuses on real operational practices implemented by best-in-class organizations, including key criteria for success across the domains of culture, knowledge sharing, customer orientation, and technology. Over 3,000 Atlassian users count on PagerDuty’s 300+ integrations to power their end-to-end real-time digital operations—and we’re excited to launch a comprehensive set of integrations for the Atlassian suite, which allows Atlassian users to add PagerDuty’s real-time digital operations capabilities to their everyday work. In this webinar, PagerDuty product manager Sean Higgins And CPrime’s Monte Montoya will show you how PagerDuty’s new Atlassian integrations help teams automate processes throughout the DevOps lifecycle, save time, and take full advantage of Jira Software, Jira Service Desk, Bitbucket, Statuspage, and other Atlassian tools. Availability is a must for leading daily fantasy sports site FanDuel, so its millions of users can play games during live sporting events. But the majority of these happen after working hours, so what happens if there’s a high-severity issue and you’re in Support? With FanDuel’s technical teams five time zones away, how do you mobilize the right resources, especially during peak traffic and usage times? In this session, learn how FanDuel addresses these challenges using PagerDuty for SupportOps. As developers, it can be overwhelming trying to balance the onslaught of new features, bug fixes, and operational improvements, on top of being on-call for your services with a steady flow of alerts and incidents to handle. Why not throw some security vulnerabilities and patches into the mix, right? Thankfully, that's someone else's job - well, it used to be. This session will highlight ways that security ownership is changing with DevSecOps and how PagerDuty can help make that an easier transition for both sides: developers and security teams. Many organizations have some kind of incident response process to coordinate during a major service outage. Some operationally mature companies incorporate a formal Incident Commander role in their process for a faster, more effective response. The Incident Commander serves as the final decision-maker during a major incident, delegating tasks and listening to input from subject matter experts in order to bring the incident to resolution. Whether or not a company has a formal process that includes an Incident Commander, most companies believe that your most senior engineer is best suited to lead an incident response. Rachael challenges this assumption. Rachael has learned first hand that successful Incident Commanders do not need to be highly technical, let alone senior, to effectively lead a coordinated response to a major incident. Comfort with a structured process and soft skills such as communication are actually more important than technical knowledge for an effective Incident Commander. All organizations need to maximize the number of people able to lead a major incident response to avoid burn-out of their most senior technical leaders and increase overall availability of their service. In this webinar, you’ll how to develop an inclusive incident response process that welcomes more Incident Commanders without compromising response effectiveness that they can immediately apply at their own organizations. The benefits of DevOps transformation are significant and well-understood, with over 70% of organizations having already implemented or planning to implement DevOps within the next 12 months according to Forrester. But it’s not a change that happens overnight. After empowering tens of thousands of operations teams to effectively manage their services in production, we’ve distilled what we’ve learned from them into a few best practices that have been foundational to driving change and transforming to be more agile. The adoption of DevOps fundamentals has changed the game of software delivery. And DevOps has come a long way from being a methodology that was considered, “for startups only” to what it is today—a culture and people first approach to engineering that enables teams to deploy faster, eliminate silos, and iteratively improve no matter your size. Do it right, and your team stands to release much faster, predictively, and safely, while mitigating unplanned work and making it easier to get ahead of customer experience. Join us as we discuss the future of DevOps with leaders from Pivotal, New Relic, and PagerDuty. We’ll look back at where DevOps has been, what it’s brought to the table, and where it’s going. • What are the biggest challenges organizations face when cultivating DevOps adoption? • What key fundamentals of DevOps are here to stay? • Can DevOps best practices and fundamentals be adopted beyond the engineering team? • Is it time for the enterprise to finally embrace DevOps? • What’s the next big thing for DevOps? Employee attrition is a challenge that every organization, regardless of industry, faces. People change jobs and move companies for many different reasons. This got us thinking—is on-call health a factor that can significantly affect employee attrition rates? If the health factors of on-call pain are bad enough, could it cause your employees to leave your company prematurely? Join us for our upcoming webinar, where we’ll address these questions and share results from a global survey of IT managers and practitioners on employee attrition. • Notifications that interrupt work and life. • Notifications that wake up responders at night. • Notifications that interrupt weekends. • Notifications that interrupt consecutive weekend days. Organizations want to modernize their IT Operations with the promise of data science and machine learning. The potential results from harnessing data is awesome: automate repetitive tasks, focus on innovation instead of maintenance, and profit from actionable insights that grows the business. However, many teams struggle with the challenge of applying data science to their operations in a way that is suited to their business, their resources, and their goals. • Which operations challenges can be improved with Data Science? • How can data science help your business? • How do you evaluate what data science is right for you? A recent Threat Stack survey finds that over 50% of companies admit to cutting back on security measures to meet a business deadline or objective. As long as companies are willing to sacrifice security at the altar of speed, the long-held dream of marrying DevOps and security simply won’t come true. Service Management (ITSM) is an approach for designing, delivering, managing and improving the way IT is used within an organization. To make that approach a reality, a core requirement is having the right strategic toolset for your unique organizational needs. But are the right tools to choose to help you deliver optimal services and keep your application and critical infrastructure available? How do you organize all the information these tools are feeding your organization everyday? Meeting the demands of everchanging IT management and security requirements means evolving both how you respond to and resolve incidents. It’s critical for organizations to adopt a scalable DevOps solution that integrates with their current monitoring systems to enable collaboration across development and operations teams, reducing the mean time to resolution. PagerDuty works with AWS services like Amazon CloudWatch, to provide rapid incident response with rich, contextual details that allow you to analyze trends and monitor the performance of your applications and AWS environment. What do you do when the unexpected happens and causes customer-impacting downtime? It’s of the utmost importance that you are prepared and can get our systems back into full working order as quickly as possible. It’s crucial to have a well-defined strategy to come together as a team, work the problem, and get to a solution quickly. Drawing from the experiences of thousands of operationally mature teams, this incident responder training will help you gain the understanding required to help support your team’s success when mitigating customer-impacting issues. During a major customer-impacting incident, every minute counts. The team must work together seamlessly and quickly to a successful resolution — and that’s done best with an Incident Commander driving coordination. An Incident Commander is tasked with being the decision maker, delegating tasks and listening to input from subject matter experts in order to bring the incident to resolution. This is a critical role and there are essential best practices you must follow to get it right. •What is an Incident Commander? ChatOps — conversation-driven development -— is changing the way development and operations teams work, helping increase productivity by an average of 32% and team transparency by 80.4%. By bringing your tools into your conversations, you can automate tasks, develop, and fix issues more effectively by learning and working in a single environment. Join us as we share use cases and examples of how to leverage ChatOps for better collaboration with more flexibility and speed than ever before. We share and demo our ChatOps extensions to popular chat tools, including HipChat, Slack, Flowdock, Cisco Spark, and more! Prevent incidents from becoming business-impacting by notifying the on-call team immediately. With Live Call Routing, anyone can reach your on-call teams in real-time to report incidents simply by calling a phone number. Teams can ensure incidents are received and resolved faster. 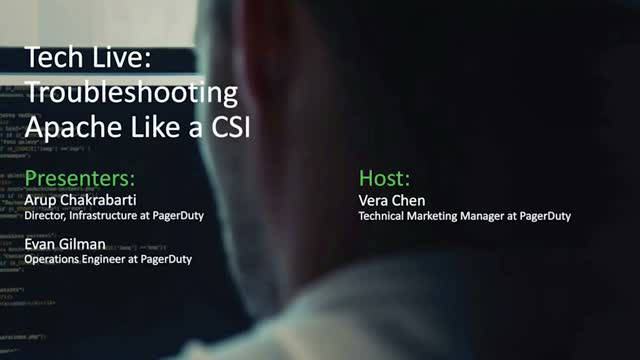 Join us as we showcase configuration and real product examples of how PagerDuty’s Live Call Routing capability is enabling improved visibility and response times for customers. PagerDuty is helping IT Operations and DevOps professionals deliver on the promise of agility, performance and uptime. Our enterprise-grade incident management helps you orchestrate the ideal response to create better customer, employee, and business value.